Provides help for students and educators in the study of American history, especially the American Civil War and the American Revolutionary War. Includes information on term paper and research topics as well as how to study and write about these chapters of American history. Where are the Founding Fathers when you need them? Is the Abraham Lincoln quote from the movie “White House Down” accurate? Abraham Lincoln and the passage of the Thirteenth Amendment, which ended slavery in the United States, is a dramatic chapter of American history. The US Constitution, when it went into effect in 1789, had guaranteed the institution of slavery in America. In the early to mid-1800's, slavery became an increasingly divisive force in the country, with virtually the entire southern populace and many northern Democrats supporting it; and much of the North, particularly the Republican Party, opposing it. When Republican Abraham Lincoln was elected president in 1860, the South decided to secede from the Union rather than risk the potential loss of slavery. The only way slavery could be permanently ended was via passage of an amendment to the Constitution. But when Lincoln took office in 1861, the passage of an amendment to end slavery was an extremely remote possibility. Even with the departure of the South’s elected representatives from the US Congress, and the election of a Republican president that opposed slavery, the anti-slavery forces in Congress still had an uphill fight. Not only did a large percentage of northern Democrats support the continuation of slavery, but the majority of northern soldiers did not want to risk their lives for freedom for the slaves. Many had enlisted to fight for the Union, and no more. Although he hated slavery, Lincoln recognized how most of the northern people felt about slavery when he took office, and made the primary purpose of the war effort to put down the rebellion and preserve the union of the states. But he watched for an opportunity to end slavery as well. Ending slavery would require all of Lincoln’s leadership skills. First of all, he had to convince thousands of northern soldiers to be willing to fight, suffer, and possibly die to end slavery. He had to convince the northern public that freedom for the slaves was worth the potential sacrifice of the lives of their sons, fathers, and husbands. He had to convince the northern congressional democrats to go against their own reluctance to end slavery. He had to do all of this in the course of the most costly, bitterly-fought war the nation would ever endure. After the Battle of Antietam, nearly eighteen months after the war began, Lincoln saw his opportunity. He decided to make use of his war powers as president to issue the Emancipation Proclamation, which promised freedom to slaves in the southern states. How he gained support for this is an interesting story in itself. He had to not only to secure the support of the soldiers, but also overcome the doubt of many of the influential members of his own political party. 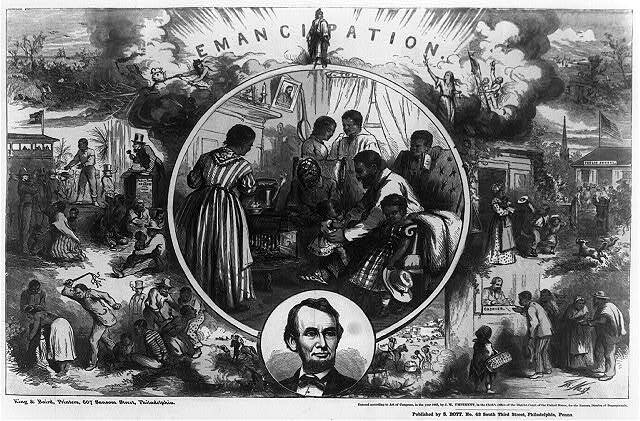 Lincoln's issuance of the Emancipation Proclamation was a huge step towards freedom for the slaves, but the amendment was still necessary to guarantee it. Surprisingly, the first effort to pass the Thirteenth Amendment, ending slavery, suffered a defeat in the House of Representatives by a vote of 93 to 65. Only four democrats voted in favor of eliminating slavery. After this defeat, Lincoln took personal charge of the effort to reverse the vote of the reluctant democrats, and managed to sway enough votes that the Thirteenth Amendment succeeded in Congress the second time. It was passed in January, 1865 by a vote of 119-56 and sent to the states for ratification. Questions that could be researched on the subject of Lincoln and the Thirteenth Amendment are: (1) Why did northern democrats oppose the passage of the Thirteenth Amendment, and who were the democrats that switched their vote? (2) How did Lincoln convince them to change sides? (3) What would have happened if Lincoln had not quickly intervened, or had been assassinated before the Thirteenth Amendment passed–would slavery have been left intact at the war’s close? (4) Finally, and this is probably the most complicated, how did Lincoln convince the northern soldiers and northern people to lay aside their personal interests and make the sacrifices necessary to free the slaves? Great American history has numerous resources on these subjects, including The Thirteenth Amendment, Lincoln the Transformational Leader, and the Outline of the Civil War.